Located between Tampa and Orlando on the historic and beautiful horticultural site of the former Cypress Gardens theme park, LEGOLAND Florida Resort is a must-do pilgrimage for the LEGO lovers in your family. But even visitors with little interest in the iconic bricks will be delighted by the LEGO sculptures, rides, and entertainment throughout the park. Since LEGOLAND is designed for children, ideally ages 2 to 10, it’s truly built for kids and remarkably low stress. The resort is laid out in sections with the water park situated in the rear. The water park is small but provides a great way to cool off when the weather heats up. Gate ticket cost: Youth (2 and under) Free; Youth (3 to 12) $86; Adult $93. Gate ticket with water park cost: Youth (2 and under) Free; Youth (3 to12) $106; Adult $113; discounts available on advanced online purchases and multi-day passes. Gate parking cost: $17; save $2 by purchasing online in advance. KidTripster Tip: If you want to get in a good day’s worth of rides at LEGOLAND and enjoy the water park without rushing, I think the two-day pass is the way to go. KidTripster Tip: The park opens at 10:00 a.m., and the lines can be long. Wait an hour, and there’s a good chance that you’ll walk right in. Or stay at LEGOLAND Hotel or Beach Retreat and get early access before the park officially opens. Choose from more than 50 rides and attractions as you stroll through the different sections of the park. Since the park is built for the younger set, you won’t find many thrill rides here. However, one popular and exciting ride is the Flying School roller coaster. This suspended coaster starts five stories above the ground and sends riders on a wild and twisty course; riders must be 44-inches tall to ride. Those who are not quite ready for that can ride much tamer coasters like The Dragon with a minimum height requirement of 40-inches. That’s where my 6-year old enjoyed the thrill of his first roller coaster! KidTripster Tip: If your child insists on driving his own boat at the Driving School, be sure he’s in the boat in front of you, not behind you. That way, if he gets stranded or turned around, you can bump him in the right direction and not have to rely on the kindness of strangers. Both my kids loved walking through MINILAND USA. You’ll recognize scenes from around the world made from those beloved, interlocking bricks. In all, 32 million LEGO bricks are snapped together to represent national landmarks and cities from coast to coast. KidTripster Tip: You can buy or bring LEGO Minifigures to trade with LEGOLAND employees throughout the resort. Look for the minifigs on their badges; they’re happy to swap! LEGO NINJAGO World is a new, state-of-the-art interactive ride where kids score points by using ninja moves to defeat villains. For more on this section of the park, click here. The LEGOLAND water park is the farthest section from the main entrance. Cool off in the 1,000-foot-long Build-a-Raft lazy river. Here your kids can build their own creations while floating. Or get soaked on Joker Soaker - just Imagine the biggest playground that you’ve ever seen and add water. Both my kids loved this area, and I heard nothing but squeals of delight. KidTripster Tip: You definitely want to get to the water park early to avoid crowds. As the day wears on, the park does get packed. We decided to hit a ride or two as we made our way to the water park and then worked our way back toward the entrance in the afternoon. You can try to resist LEGOLAND’S original Granny’s Apple Fries, but you’ll miss out on one sweet treat! The warm fries are dusted with cinnamon and sugar and served with a sweet whipped cream dipping sauce. Yum! For lunch, the options include burger, dogs, pizza, and sandwich shops throughout the park. It’s a bit expensive and on par with typical fast food. We chose off-site dining but did splurge on treats. Our kids’ favorite was Firehouse Ice Cream toward the back of the park in LEGO City. You just can’t beat a cool scoop of ice cream under the hot Florida sun. We did find the burgers and fries at Castle Burger satisfying; it’s outside among the picnic tables next to The Dragon roller coaster in LEGO Kingdoms. KidTripster Tip: You’re allowed to bring in outside food in bags or small coolers. We packed plenty of snacks to save money and time. We kept them in shoulder bags that we stored in the bottom of our stroller. LEGOLAND Beach Retreat is a village-style, lakefront resort that offers 83 surf-themed bungalows, all decked out in LEGO décor. The little houses actually look like they were built out of LEGOS! Enjoy your own, cozy patio space as your kids climb in the courtyard playground. The bedrooms sleep up to five and include separate quarters with bunk beds for the kids. You could tell my kids immediately appreciated that this place was built for them. Watch my son’s first impression here. But the pool was their favorite, of course! With a zero-depth entry, it’s very inviting to the little ones. We were a bit surprised that there wasn’t more sand for a true beach feel, but you will find a small sand play area. Rates start at $135/night but run considerably higher during peak season. To see our full review of Beach Retreat, click here. Brick by colorful brick, LEGOLAND Hotel is creative lodging come to life. Enjoy a Welcome Treasure in each room complete with a LEGO prize. The fun continues with an in-room treasure hunt as well as bricks to play with during your stay. This five-story hotel features 152 rooms and is mere steps from the park entrance. Choose from one of four themed room types. Treasure awaits in the pirate-themed rooms. Or sleep like royalty in a kingdom room. And wait until you see the pool. Grab a brick and jump on in! Rates start at $165/night; book well in advance to get the best pricing. KidTripster Tip: As a Beach Retreat or LEGOLAND Hotel guest, you can get in 30 minutes before the park officially opens. 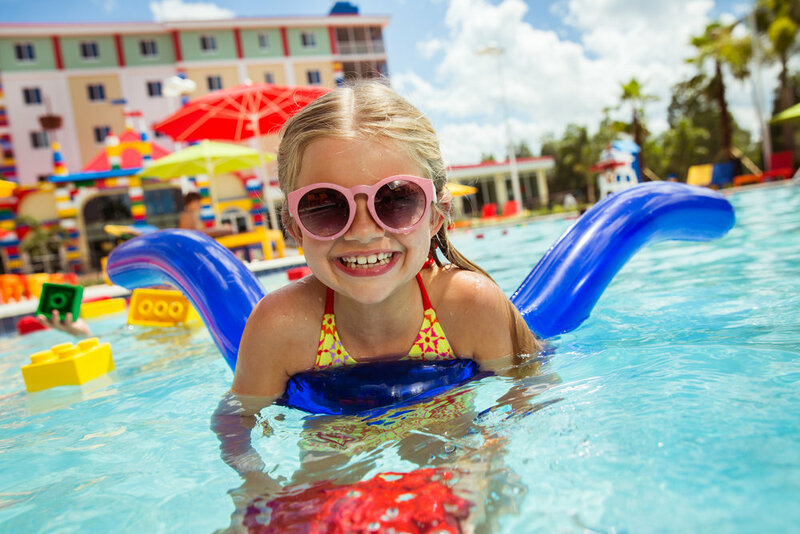 While Beach Retreat and LEGOLAND Hotel may be a little pricier than some other area lodging options, both are super child-friendly and unique experiences unto themselves. Plus it doesn’t get more convenient! 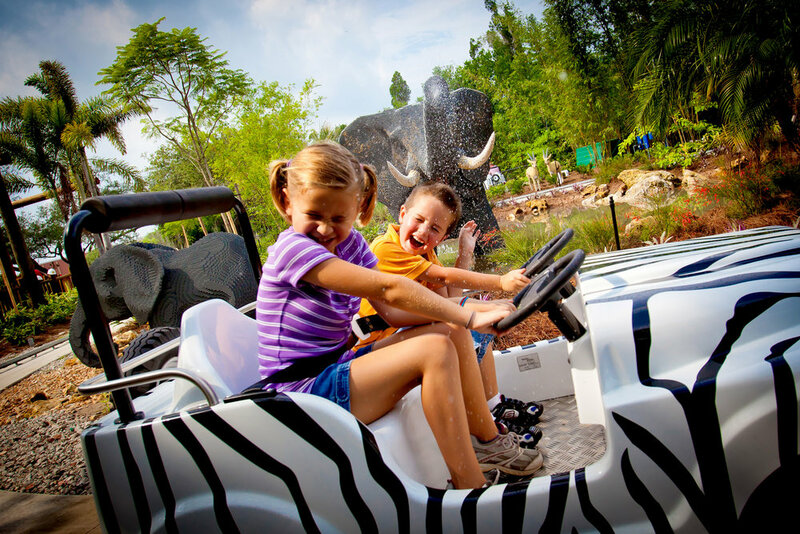 LEGOLAND Florida is about a 45-minute drive from either Orlando or Tampa. If you’re staying in Orlando, you can take the LEGOLAND Shuttle. Know that you have to reserve your seat 24 hours in advance. Cost: $5/passenger. Tracy Atwood is a former journalist who loves being outside in nature. She’s married to her college sweetheart. Together, they have a boy, a girl, and a loud Siamese cat.